首先来看看苹果官方给出的解释： The NSRunLoop class declares the programmatic interface to objects that manage input sources. An NSRunLoop object processes input for sources such as mouse and keyboard events from the window system, NSPort objects, and NSConnection objects. An NSRunLoop object also processes NSTimer events. 1.Time Source. 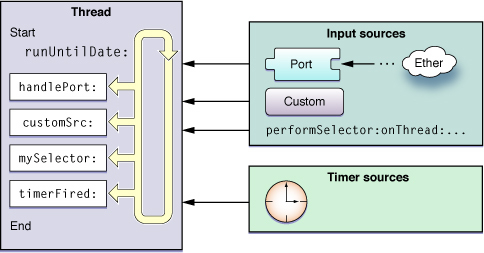 Timer sources deliver synchronous events, occurring at a scheduled time or repeating interval. 苹果文档中有句话需要注意，Timer sources deliver events to their handler routines but do not cause the run loop to exit. 为了能够处理input sourcr，run loops 产生notifications.通过注册成run-loop observers可以接受到这些通知（通过Core Foundation 来注册observers）.